Mastered by Bernie Grundman! Includes Bonus Track! Renew... rebirth... revive: A well means more in analogy than it does as a bearer of water. It can symbolize a complete transformation or a brief transition - the rejuvenation of a spirit in passing. A trip to beautiful Jacob's Well outside of Austin, Texas with friend Doyle Bramhall proved an inspiration too rich to ignore. From this almost chance encounter comes The Well, a lovely collection of deeply-felt songs about renewing, rebirthing and reviving. Songs on The Well feature stories about life-defining passages "Prairie Melancholy," rebirth "The Well," conquering fear "The Panther," Thankfulness "The Nightingale," a relationship at the cross-roads "And So It Goes," appreciation "Patriot's Dream" and discoveries "You Don't Know Me.". Jennifer Warnes has chosen pieces that hint their deeper meanings. There are no soap-boxes with which to preach The Well. Produced by Jennifer Warnes and composer/producer Martin Davich (ER), this largely acoustic album freely explores folk, pop, roots, blues and jazz. The singer has collected stellar musical talent to flesh out her vision, including; Arlo Guthrie, Doyle Bramhall (along with his son Doyle II), Rick Cunha, Vinnie Colaiuta, Dean Parks, Blondie Chaplin, George Doering, Leland Sklar, Abraham Laboriel, Lenny Castro, Van Dyke Parks and many others. On the technical side, the brilliant sound of The Well was crafted by Mark Johnson, Frank Wolf, George Massenburg, Elliot Scheiner, John Cevetello, Paul Deiter and Mark Cross. 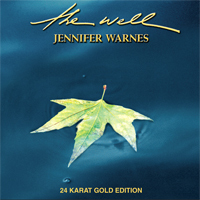 This first ever authorized 24K Gold CD version of The Well was supervised and resequenced by Jennifer. This disc includes two never before heard tracks and an exclusive extra bonus track featuring a touching duet between Jennifer and longtime friend and legend Bill Medley.